June | 2014 | HowDoYouLandscape? The chair of Landscape Architecture of the Delft University of Technology is for the fourth time contributing to the Oerol festival – Sense of Place. This year we are located on the Eastern part of Terschelling, at Kaapsduin. Kaapsduin is part of a dune complex which has been stabilized by planting natural vegetation to protect the villages and the polder behind it of being covered with sand brought mostly by the most energetic wind wave coming from the northwest / north-northwest. The sand has been moving towards Kaapsduin where it encounters obstacles formed by human intervention. Due to this process Kaapsduin has being growing to a height of 31 meter, offering a splendid view of both the North Sea and the Wadden Sea. Since the 70’ part of the primary dune formations along the North Sea, in the face of Kaapsduin, are being opened and have been monitored since. On this part of the island sand is able to be blow into the island creating a formation called ’stuifduinen’ where special flora and fauna appears. This experiment is meant to understand which are the possibilities to let the island level up again, forming a natural defence against the sea level rise. Like last year, we went this year to Terschelling for a three-day introductory field trip to Terschelling landscape. Throughout this field trip, we made several excursions on the island and visited the site location for the project. Additionally, students executed short brain storm sessions in the depot of Oerol and attended a lecture by Freek Zwart from Staatsbosbeheer. The main idea was to experience the dunes at Kaapsduin through the senses and by searching for the natural patterns, materials, and history related to it. These first impressions and experiences from the excursion to Terschelling together with bibliographical studies about the formation of the island and concepts of Land Art and Genius Loci were the starting point for further investigation in the atelier. Experiences and ideas generated during the field trip and studies in the atelier have led to several concepts for an intervention in the location that creates or enhances a ‘sense of place’. During these weeks several workshops were held with guest artist – Erick de Lyon and Irene Fortuyn – and experts on Terschelling and materials like sand – Albert Oost and Mark Voorendt – to boost new inputs and possibilities. This was the time to generate as many ideas as possible and check them trying to step over the own limitations, reaching the unexpected. Some of this ideas are pictured below as part of the process and final project. The aim of this year final project, which will be executed in a few days, is to express the dune landscape in a landscape artwork which addresses this sandy, hilly site in two ways; a scientific and a sensorial approach. The scientificpart of the project is to follow a path where information about the island will be given and through a booklet the visitors will get at the entrance of our project containing map, cross sections showing the evolution of the dunes and tools to measure for instance, how blue the sky is or the speed and direction of the wind. The main addressed issues are the origin, dynamics and formation of the dunes, the dune landscape succession and the most common fauna and flora to be find on the site. Here the time is expanded in order to explain the formation of the landscape through the last centuries. The sensorial approach explores the texture, colors, temperature, wind and sounds of the dunes. Here, the visitor is asked to leave the path. He/she will be accompanied to an isolated spot with specific landscape characteristics and marked by a special chair. The visitor will be left there for a while. The personal embedding in the landscape, the enclosure of the body with the surroundings, the lack of time pressure are supposed to bring the visitors closer to the place they are in and at the same time giving them the possibility of having an intimate/solitaire experience. The alternation of approaches unveil the characteristics of the dune landscape which are already there, giving the visitor new perceptions and triggering them to look closer, to understand better the dynamics involved in this landscape and put themselves and us further questions. The visitor can leave behind their experiences and thoughts which will be sent back to them of someone else at the end of the festival. Assignment coordinators and tutors of the Elective Landscape Architecture ON site, being part of Oerol 2014 (Elective Msc2-chair Landscape Architecture/TUDelft): Denise Piccinini and Frits van Loon. 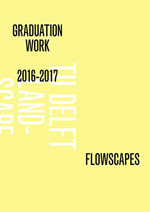 Students: Antje Adriaens, Maria Alexandrescu, Lila Athanasiadou, Berta Gruodytė, Jafeth Hagoort, Ruben Hoek, Rosa Hurkmans, Jingni Li, Robin de Louw, Pierre Oskam, Eva van Rijen, Koen Steegers, Mike Tomassen, Gabriela Villas Bôas, Veerle De Vries.